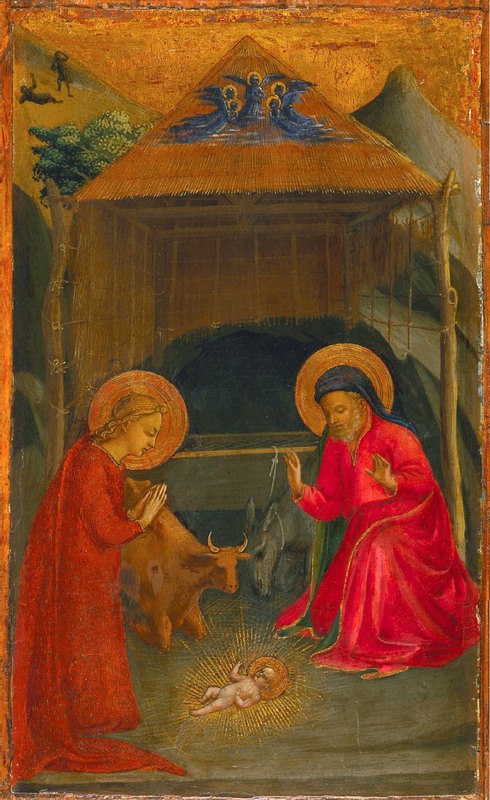 These two small panels, identical both in size and support — and now missing their original engaged frames — are presumed to have once formed part of a portable altarpiece for private devotion. Still visible on the reverse of each painting is the faux-marbre pattern that often decorated such objects and that would have been evident when the panels were folded or closed. The most cogent and penetrating discussion of the Forli panels to date was published by Roberto Longhi in 1940. 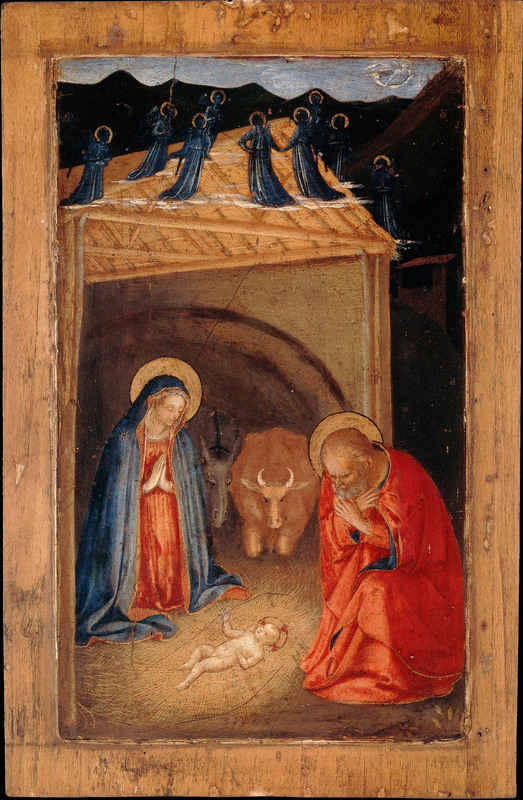 (*2) While acknowledging Angelico's debt to Gentile da Fabriano in the evocative nocturnal setting of the Nativity, Longhi identified Masaccio's powerful monumental vocabulary as the immediate source for the advanced spatial and formal solutions that distinguish both of the present compositions, and, accordingly, ascribed them to the period of the artist's greatest receptivity to Masaccio's models, between 1425 and 1430. Describing the massive, solidly articulated bodies in the Agony in the Garden as the "most Masaccesque persons that one may be given to find outside of Masaccio," Longhi drew a pointed comparison between the figure of the pensively absorbed Saint Peter, in particular, and the detail of the same apostle kneeling before the water in Masaccio's fresco of The Tribute Money. No less impressive than the statuesque figure types that inhabit these scenes, as Longhi observed, is the ambitious, monumental spatial structure of the compositions, despite their reduced scale. In a brilliant display of technical virtuosity, the steeply foreshortened but that occupied center stage in the earlier, Minneapolis Nativity (cat. 17), as well as in Angelico's later versions of the subject, is here rotated, so that it is viewed at a sharp angle from the right, with the same rigorously observed recession in depth characterizing all of its architectural components. Possibly executed in conscious consideration of the panel's position on the left in the original structure, this solution reflects the artist's keen exploration of the laws of one-point perspective and the principles of realistic representation. Similarly, in the Agony in the Garden, Angelico's intelligent adaptation of the scene to the vertical format of the panel results in a more Psychologically charged and complex version of the traditional subject. 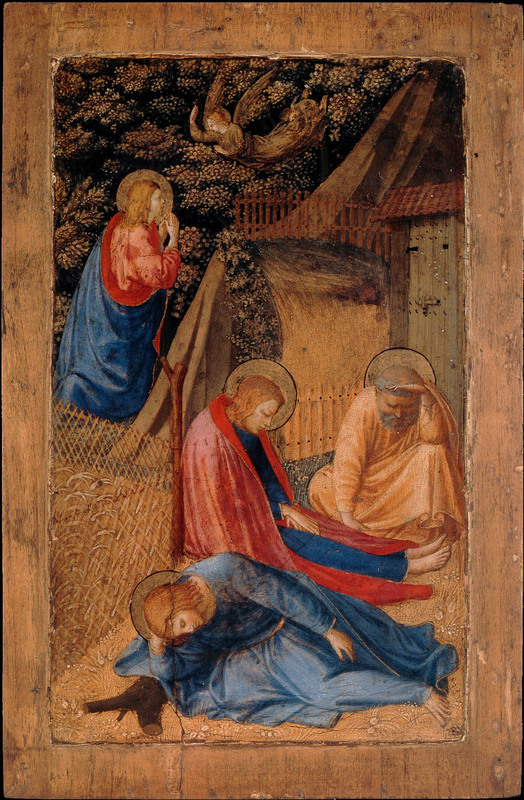 Rather than following the typical iconography for the sleeping apostles, who are usually presented as an isolated group in the foreground, the composition is unified by the carefully orchestrated placement of the figures in different, superimposed zones, articulated in depth by the orchard fences and by the receding roof of the garden hut. From the beautifully depicted, recumbent Saint John in the foreground, enveloped in ample blue robes and leaning on his arm like a fallen soldier of antiquity; to Saint Andrew and Saint Peter in the middle distance above him; to the praying figures of Christ and the angel at the upper left, the eye is made to linger over each and every detail of the narrative. Of the other works by Angelico from the same "Masaccesque" period identified by Longhi, the closest to the Forli panels is the series of predella scenes centered around the Philadelphia Burial of the Virgin (cat. 25 C), here dated to about 1429. The stringent correspondences, both in figure types and spatial conceits, among the Forli paintings and the two other panels from that predella now in San Marco and in the Kimbell Art Museum, Fort Worth, in particular, prompted Longhi to suggest that they were part of the same complex. While recognizing that all these works must, indeed, be contemporary in date, Pope-Hennessy(*3) rightly noted that they could not, in fact, have belonged to one altarpiece, simply based on technical considerations, and proposed that the Forli panels might, instead, have comprised the wings of a small triptych. (*1). See Viroli 1980, pp. 32-34 (with earlier bibliography); Spike 1996, pp. 236-37; Bonsanti 1998, pp. 114-15. (*2). Longhi 1940 (1975 ed.). pp. 40-41. (*3). Pope-Hennessy 1974, p. 226. (*4). Schmidt 2002, pp. 395-419, esp. pp. 403-6. (*5). Eisenberg 1984, pp. 271-89; Bent 1984, vol. I, pp. 388-91. (*6). "Therefore, since he was a real man and placed in great anguish as a man, pity Him as intimately as possible. Consider and see with perseverance all the actions and afflictions of your Lord" ("Meditation on the Passion of Christ Before the Morning," in Bonaventure 1977 ed., p. 324). (*7). Another scene that may perhaps be of some relevance for this interpretation of the Agony in the Garden is a panel attributed to Masaccio in Altenburg, Germany (Penndorf 1998, p. 46), in which the Agony in the Garden is paired with the Communion of Saint Jerome, highlighting the Eucharistic significance of the theme. Equally of some interest is the mention of a small tablet with "Christ on the Mount of Olives" ("una tavoletta dipintovi storia di Cristo di Monte Uliveto") in the 1492 inventory of the Medici palace (Spallanzani and Gaeta Benda 1992, p. 80); the painting, then located in Piero's bedroom, is listed together with a small panel of the Annunciation, described as "opera grecha."